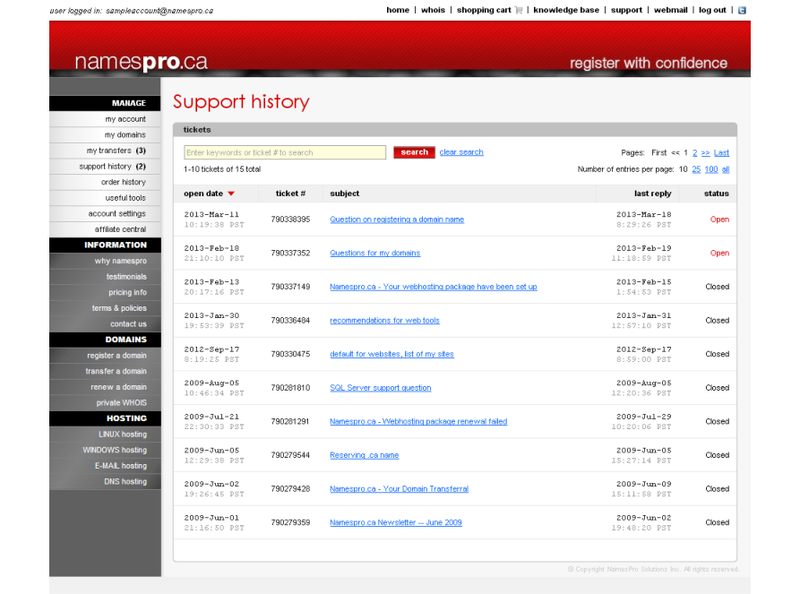 Our comprenhensive knowledge base is a central database for all issues that have previously been addressed. It is intended to provide quick and accurate answers to our users. Continuous effort is put in to ensure all information is up-to-date and relevant. 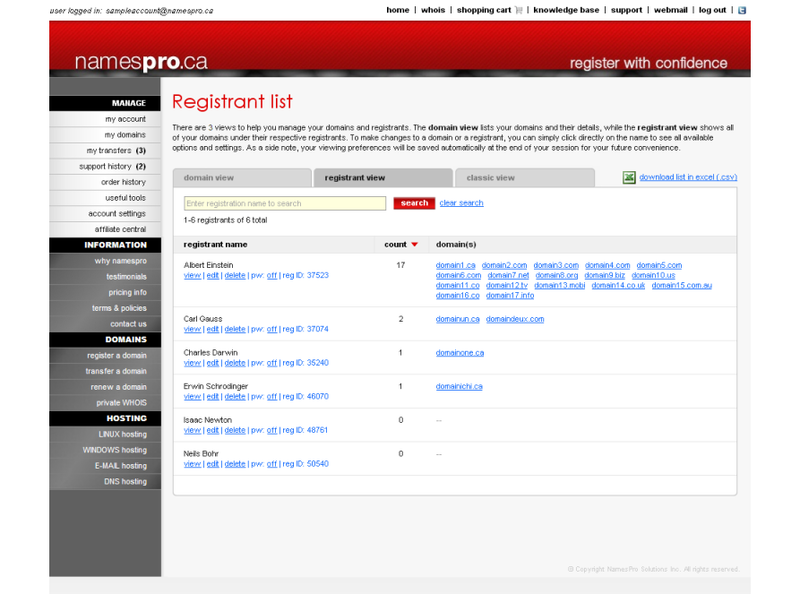 KB-1001 How do I transfer a dot-ca domain from another registrar to Namespro.ca? 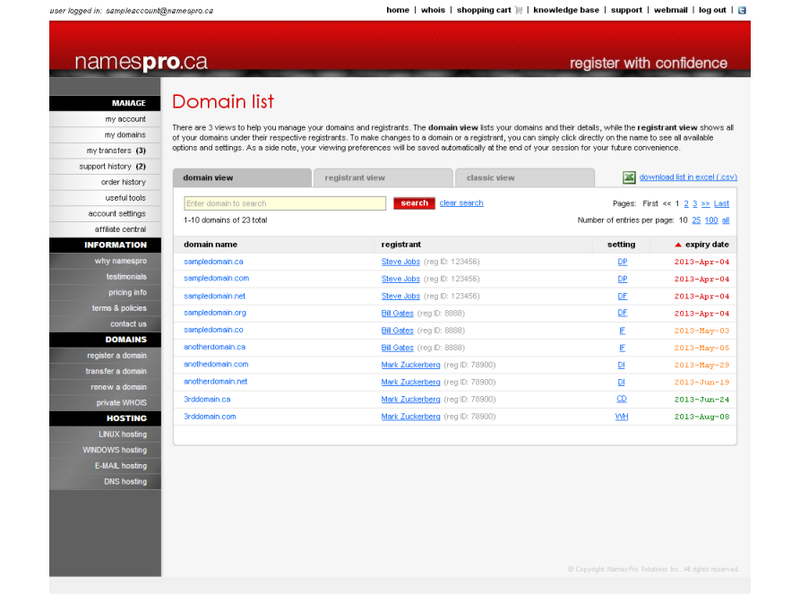 KB-1002 How do I transfer a non-dot-ca domain from another registrar to Namespro.ca? KB-1004 How do I transfer a domain from one registrant to another? KB-1005 How do I merge two registrants into one? KB-1006 How do I unlock a domain and retrieve the authorization code for a domain? KB-1007 How do I change my registrant name? KB-1011 Will my domain experience any down time during a registRAR transfer process? KB-1012 I have just bought a domain. What actions should I take? KB-1013 I have just sold a domain. What actions should I take? KB-2005 How do I access my mailbox via webmail? KB-2006 How do I access my mailbox using an e-mail client via POP3? KB-2007 How do I access my mailbox using an e-mail client via IMAP? KB-2008 I can receive e-mails but cannot send. What is the problem? KB-2009 How do I whitelist an e-mail address? KB-3000 How do I retrieve my Windows hosting control panel and FTP password? KB-3001 How do I update my Windows hosting control panel password? KB-3002 How do I provide individual Windows hosting control panel login to my users/clients? KB-3003 How do I update my FTP password? KB-3004 How do I create FTP sub-accounts? KB-3005 How do I password-protect a directory? KB-3006 How do I change file permission? KB-3007 How do I access my web statistics report? KB-3008 How do I publish my website using Microsoft FrontPage or Microsoft Expression Web? KB-3009 How do I renew my Windows hosting plan? KB-3010 How do I upgrade/downgrade my Windows hosting plan? KB-3011 How do I install 3rd party applications on my Windows hosting plan? KB-3500 How do I retrieve my Linux hosting control panel and FTP password? KB-3501 How do I install Wordpress, Joomla or other 3rd party applications on my Linux hosting plan? KB-4000 How do I update the name server (DNS) records for my domain? KB-4001 How do I forward my domain to existing website? KB-4002 Am I eligible to register a dot-ca domain? KB-4005 I have just registered a new domain. Why is it not accessible?  KB-4008 I do not want my domain any more. What should I do? KB-4009 How do I contact a dot-ca domain owner? WHOIS query returns no contact information. 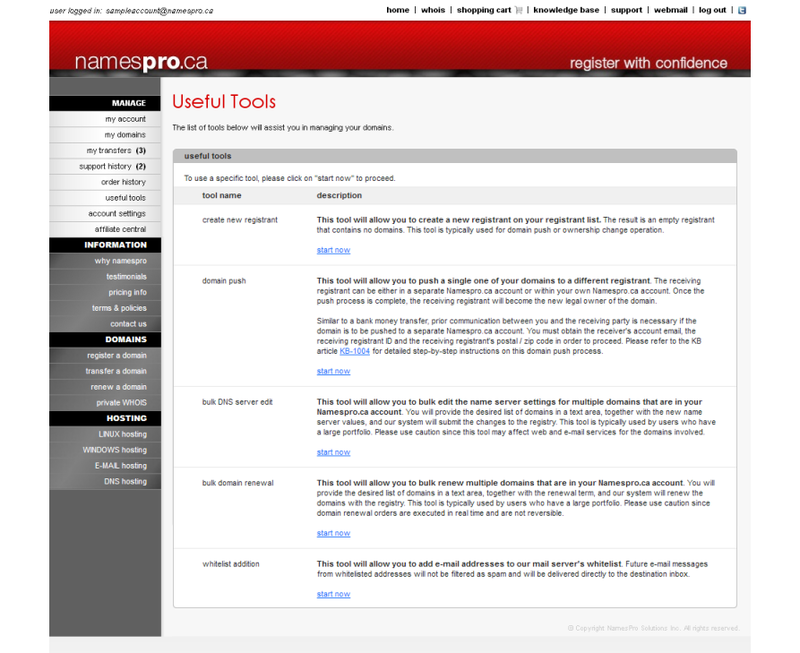 KB-4010 How do I change the auto-renewal setting of my domains? KB-4011 How do I register my own name servers? KB-4012 How do I create a CNAME, MX or TXT record? KB-4013 How do I register an expired dot-ca domain (TBR domain)? KB-4014 What are the valid corporation status identifiers for a CIRA Corporation registrant? KB-4015 How do I register a French (IDN) dot-ca domain? KB-4016 What is DNSSec and how to use it? KB-5000 How do I update my billing information? 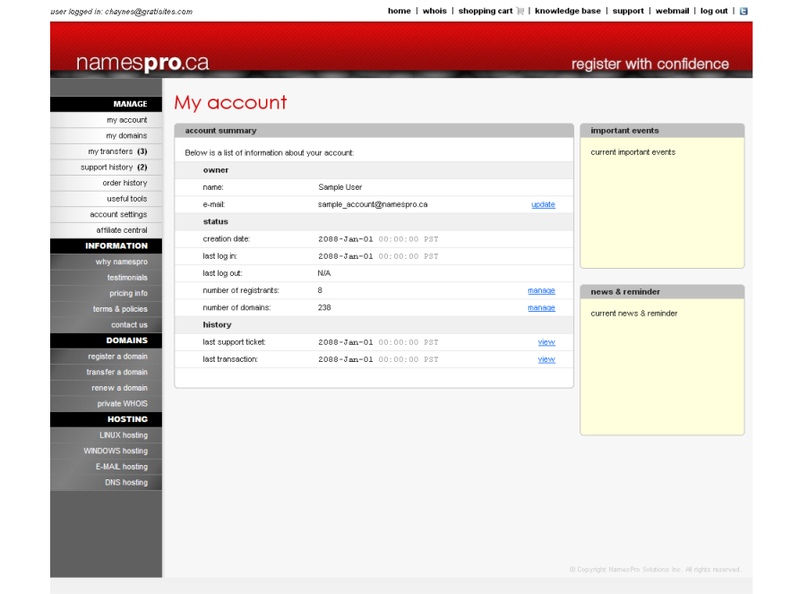 KB-5001 How do I retrieve my Namespro.ca account login information?